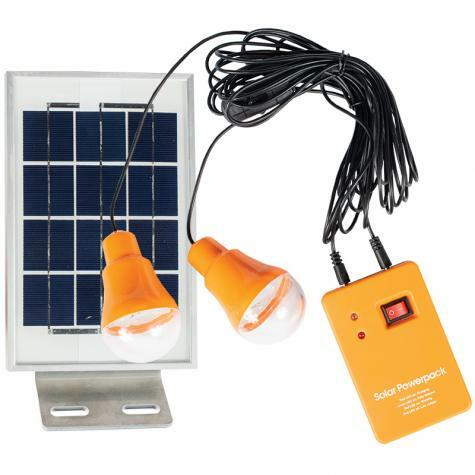 Solar-powered LED light kit provides illumination to chicken coops, tool and garden sheds or anywhere else plug-in power is inaccessible. Includes (2) independently controlled lights and solar panel with mounting bracket. 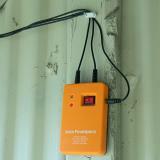 For lighting poultry, garden and tool sheds where 110V power is inaccessible. Not intended for use to induce egg laying in winter months (wrong type of light). 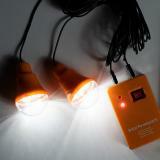 Provides light to coops and sheds not accessible by standard 110V power. Aids in checking livestock during nighttime chores. Light output is similar to that of a 20 watt bulb. 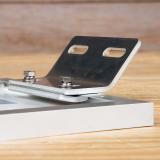 When attaching bracket to backside of solar panel it helps to think of the two metal plates as a clamp. The trick is to first assemble the clamp loosely with the bolts. Then slide the clamp onto the lip on the back of the solar panel's frame. (The larger plate goes over, the smaller plate slides under.) Position the clamp where it works best for your application and tighten the bolts. Note: The holes on the frame of the solar panel will not be used. Mount the solar panel so it is in full sun facing south. Mount the power pack to an inside wall to keep it out of the elements. Securely fasten it so it's not dangling. Make sure that the solar panel has had adequate time to charge the power pack (normally 6-8 hours of sun exposure). Activate switch on power pack; then use the switch on each light cord to turn the lights on/off as needed. These work perfectly for our chicken coop! Brighter than expected and the length of the cords are awesome!!!! Giving 4 starts for now, hopefully I can come back & update after really using it. It is decently bright. Tested it in my kitchen & I can easily see everything, even in the other direction. Doesn't look like I can add pictures, unfortunately. I needed something light a shed we have on the back corner of our land. Carved out an area that is wooded and with shade. This is the perfect solution providing plenty of light. Will be getting another set-up for our dog kennel. 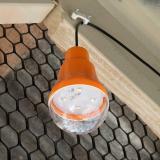 I bought this light set for a boat storage shelter, No power available so the solar powered lights are perfect! They are well made and very simple to install. I am very satisfied and also a very reasonable price. Thanks Premier!